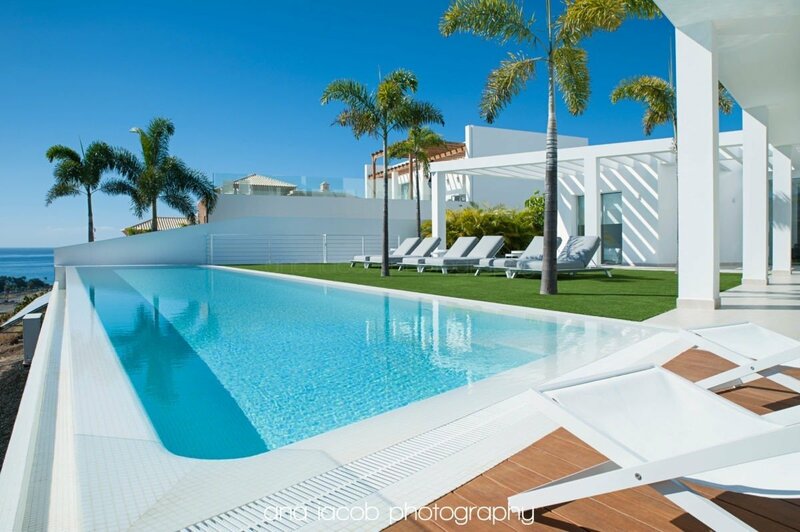 As a real estate photographer, I have had the honour to be invited in some of the most glamorous and exclusive homes, or soon-to-be homes, in Tenerife. From private, sea view penthouse apartments, to minimalist and modern townhouses, as well as opulent villas surrounded by tropical, luxurious gardens – perfect residences for owning or as investment properties. Villa Malibu is one of these properties. It’s exclusively designed and distinctly furnished with the finest amenities and a stunning attention to detail in terms of build and design. Situated in one of the most desirable locations in Tenerife, Costa Adeje, and only a stone’s throw away from the picturesque village of La Caleta, Villa Malibu is also close to lush golf courts and the high-tech exclusive sports training centre T3, considered one of the best in Europe. Indeed, Villa Malibu has it all: spectacular sunset ocean views, a large swimming pool, gardens and… privacy. Check out some of the photographs! This lavishly designed estate is developed by Tenerife Resort Invest and I collaborated with CEO and company owner Stazio Marchini. Only after working with Stazio do I truly understand was a pioneering, trendsetting project Villa Malibu is. Properties like these elegantly re-shape the landscape of the island, offering luxurious homes for investment or to settle down in. Stazio’s area of expertise centres of him carefully selecting an extensive team of professionals; architects, builders, interior designers and so on, in order to materialize his vision. He explains why the famous real estate agents mantra: “location, location, location” is still at the top of customers’ purchasing or investing decision. The Spanish housing market increased with 14 percent in 2017 from the previous year and most transactions are driven by foreign buyers including the British, French, German, Belgian and Italians with high interest in overseas purchases in coastal and sunny all-year-round regions, like the Canary and Balearic Islands. Villa Malibu was recently finished and handed over to a very happy owner and so Stazio has a couple of other projects lined up – luxurious properties located in some of the most prestigious areas in the south of Tenerife, with the same signature minimalist touches. And, when the time comes I’ll be doing a photo shoot at his next properties as well. Why? In his own words, Stazio explained to me the importance in showcasing his properties with a professional photographer like me. “Bad photography can make buyers and investors question the integrity of the projects,” he told me. “A successful listing is all about how great photography showcases the property – attracting the right kind of attention in the first place. And Stazio added couple of words about my work which I am thankful for. Picture your love for Valentine’s Day! How to find the best photographs for your business?